As a fan of Vladimir Janda’s provocative body of work, I have highlighted his research throughout my teachings and hopefully integrated his wisdom into mainstream bodywork. I’ve written extensively on aberrant postural patterns associated with his infamous upper crossed syndrome, such as a protruding neck, rounded shoulders, kyphotic t-spine, jutted chin, hyperextended O-A joint, and internally rotated arms (Fig. 1). Yet one overshadowed gem of Janda still exists- the humble pain generator deeply hidden within his upper crossed pattern –The Fixated First Rib. Symptoms of a first rib fixation range from head, neck, jaw and shoulder pain, to breathing difficulties and arm numbness. The first rib is a relatively unstable structure that acts as the attachment site for several muscles including the scalenes. In the upper cross forward head carriage, the scalenes can often become hypertonic and exert an upward pull on the rib (Fig. 2). In chronic cases, the first rib can become so “jacked up” (fixed in inhalation) that it is painfully frozen into inaction. Thus, the stage is set for possible brachial plexus compression and accompanying thoracic outlet syndrome that leads some naïve and pained individuals to opt for surgical removal of the first rib. Ninety percent of fixated rib assessment can be determined from the client’s history. The palpation exam that follows will typically confirm the client’s history findings. Make it a routine to examine lifestyles leading to episodic injuries. Give full attention to the “mundane” such as sleeping habits, work demands, computer hours, posture, and all injuries from the innocent to the life-changers. Like family genetics or nurture vs. nature idiopathies, the body is literally a manifestation of its imbalance, either subconsciously through subtle movement patterns, to traumatic body game changers. Elevated first ribs commonly occur in the stomach-sleeping population or those who sleep with one arm tucked under their head. Extensive computer work with poor mouse ergonomics may hyperexcite cervicothoracic joint and ligament mechanoreceptors adding to the distressed upper crossed muscle imbalance pattern. These people typically complain of constant dull, aching pain and tightness in the upper shoulder girdle. Additionally, many whiplash-type injuries have first rib involvement. Tennis players, golfers and weight lifters seem most susceptible to neurovascular compression from first rib fixations. 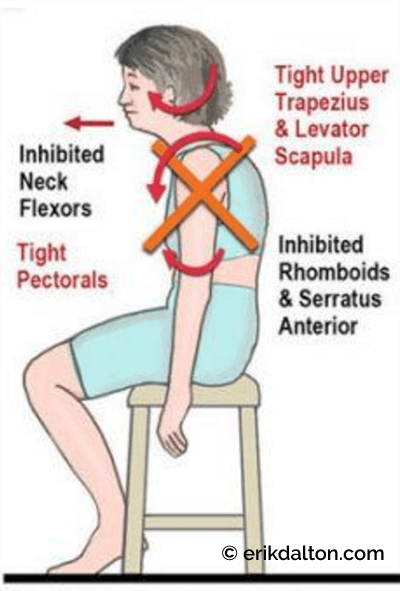 To assess, simply stand or sit behind the supine client, and with soft finger pads, grasp the anterior aspect of the upper traps and gently pull posteriorly (Fig. 3). With the upper traps retracted, allow your fingers to wade through the tissue searching for the bony feel of the superior shaft of the first rib. Ask for a deep inhalation and let your fingers resist any upward movement produced by the scalenes. If the rib does not rise during deep inhalation efforts, it could already be elevated and stuck. 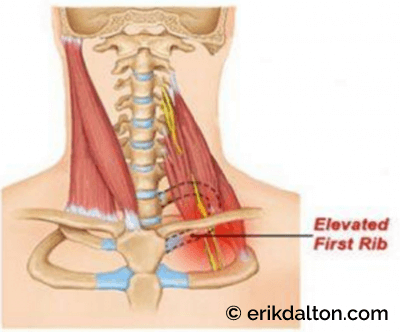 To test, palpate bilaterally by gently springing the rib inferiorly and observe for motion dysfunction. Check for areas of tenderness, ipsilateral scalene hypertonicity, and pain upon exhalation. Both pain and asymmetry can indicate first-rib dysfunction. During palpation, expect some swelling and tenderness in the upper trapezius area. Chronic cases can result in self- guarding due to myospasm. Assure your clients that this “jump sign” is a typical response to the “touchy” fixated rib and encourage their feedback. Address any of their concerns as you work this highly sensitive area. Kamkar A, Cardi-Laurent C, Whitney SL. Conservative management of superior subluxation of the first rib. J Sport Rehabil. 1992;1(4):300–316. DeStefano L. Greenman’s Principles of Manual Medicine. Philadelphia, PA: Lippincott Williams & Wilkins; 2011.